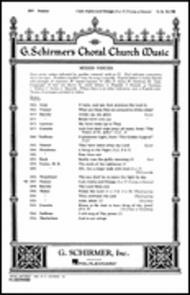 SATB with Organ and Soprano or Tenor Solo. Composed by John Stainer (1840-1901). Choral. Sacred, Concert, Classical, Contemporary. Octavo. 8 pages. G. Schirmer #OC3897. Published by G. Schirmer (HL.50294490). Gloria from "The Twelfth Mass"